Zelda sprite was done by someone called Crimson (thanks for the correction Puzzledude) , I just inserted it into the game. 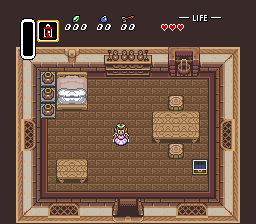 Palettes are done, although text isn’t due to Hyrule Magic being utter trash that breaks the dialogue when edited. This will be base for your hacks that feature Zelda instead of link. Patch is up! Get it over on the LttP hack page! I’m totally looking for something like this so I was excited when I saw your post here but it seems like the patch isn’t up on romhacking.net? I looked all through their directory for LTTP there and found nothing. Did they take it down? Can you offer and alternate download spot? I uploaded your IPS to zbucket and linked it to Zeldix forum. We had this PNG for a long time, but nobody took the time to actually insert it. Good to know that someone knows how to do things. The sprite was drawn by CRIMSON not COSMO. Thanks for the correction. I’ll fix it immediately. Also, I’m female, not male. Nice. First time I see a female doing romhacking. Regarding Hyrule Magic. It doesn’t really break the texts. But, the texts are SRM dependent, which means if you edit them, you must not use a save state. If you use a save state and then read the texts, they will appear bugged. So after editing texts you need to load the game normally (using the standard save) and the texts will be fine. One other thing that Hyrule Magic breaks when editing texts is the camera shake though. So everytime you edit text you need to go to address E8000 in the hex editor and fix the bytes there to 01 FF (standard shake). See the monologue code ends at E7FFF and HM writes this falsly into the next bank. By the way, in the game, Zelda is now rescuing Zelda. This can be fixed by editing the actual Zelda head (NPC instead of main sprite) to Link. Then a woman would be rescuing a man (why not). I didn’t really care about that. I just replaced Link with Zelda. I figured I’d let other people worry about that.